Repair and Recovery for any commercial or fleet vehicle. Repair and Recovery for motor caravans, large R.V’s and horse boxes too. Fully fitted mobile workshops for any mechanical breakdown. Heavy Recovery Units to take your vehicle for repair to one of our fully fitted HGV workshops or to any UK destination of your choice. 24 hour roadside service 365 days of the year. High levels of service and expertise on commercial vehicles. Money savings; membership of motoring organisations is not necessary with our very competitive recovery and repair fees for owner drivers. Peace of mind for owner drivers and infrequent users of heavy and commercial vehicles. Full repair and recovery facilities available across Southern England. 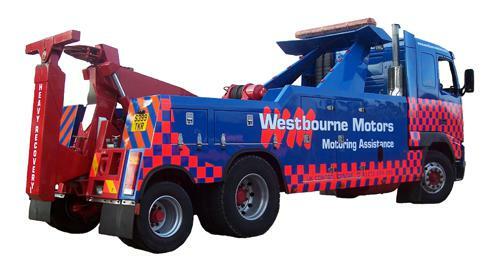 With the largest fleet of specialist recovery vehicles in the South, Westbourne Motors know how important it is to keep large commercial vehicles mobile. We aim to repair every vehicle.